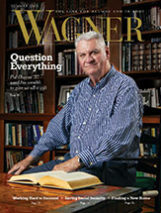 In the summer 2008 issue, 'Wagner Magazine' launched a four-part series to follow students through their four years of the Wagner Plan for the Practical Liberal Arts. At the heart of this innovative curriculum, adopted in 1998, are “learning communities” (LCs) that integrate hands-on experience with interdisciplinary studies. In part one, we reported on one of Wagner's first-year LCs, in which students explored ancient Eastern religions and contemporary social psychology through coursework, writing-intensive tutorials, and activities beyond the classroom. In this issue, we present the continuing academic journeys of four students in their sophomore year, as they enter different majors; take their intermediate learning communities, the second step in the Wagner Plan; and explore all that Wagner and life have to offer. If the stuff in a student's dorm room says anything about whom that student admires, then Swiss psychiatrist Carl Jung is Kyle Glover's hero. The Carl Jung Action Figure, a 5-inch plastic icon of the bespectacled doctor, graces Glover's desk in Guild Hall next to his copy of The Portable Jung. For a student of such ambitions, Wagner's learning communities are just about ideal. This past semester, Glover took his intermediate learning community (or ILC). Titled “The Outsiders,” this ILC linked a course on 20th-century women philosophers and a world literature course. New perspectives: that's what Glover treasures about his education. This semester, he also found a way to extend this interdisciplinary mode of learning throughout his studies. “I made my own major,” Glover explains. Called “spiritual studies in modern philosophy and psychology,” it combines the study of religion, philosophy, and psychology. “I wanted to call it Jungian studies,” says Glover; but his advisor, psychology professor Miles Groth, steered him toward the above title. Glover got to know Groth when he joined a research group the professor is leading. The Wagner Men's Project is part of a nationwide program that aims to increase college-age men's involvement in volunteering, leadership, and vocational decision-making. At Wagner, students meet weekly for discussion of these issues, and they are mentoring fatherless boys from the Staten Island community. In February, Glover traveled with Groth and another student researcher, Andrew Hagen, to the sixth annual Conference on the College Male at St. John's University in Minnesota, where they gave a presentation about the Wagner Men's Project. Alexandra Mallilo stands before a classroom of fourth-graders at St. Christopher's School in Staten Island. The slender brunette is not in the least flummoxed by this wiggling mass of energy. She and Chris Fourman '09 spend an hour with this class every week to teach a special curriculum designed to make kids aware of bullying and what they can do to combat it. This is Mallilo's second semester of teaching the program, part of a research study led by Wagner sociology professor Laura Martocci and psychology professor Amy Eshleman. The class begins with a tangent. The children have a question for Miss Alex and Mr. Chris, says Mary Cummings, the teacher's aide. “Why do people hang their shoes on wires over the street?” Mallilo and Chris look stumped. “I don't know, why do you think they do that?” Mallilo asks the children. Hands shoot up. Because they are too small, says one. Maybe they don't want them, offers another. They're torturing the shoes, says one imaginative boy. “Those are all good answers,” Mallilo says. “We don't know the answer, so we'll do some research and let you know what we find out.” And she neatly segues into the day's lesson: how to apologize. As a double major in elementary education and anthropology/sociology, Mallilo is spending lots of time in schools and in the streets in addition to her “book work,” as she calls it. She has done research on homelessness in New York. She has attended several plays, including the innovative Broadway production of Cat on a Hot Tin Roof with a black cast. And she has spent hours in classrooms, observing teachers and students. Mallilo uses every opportunity to get involved in the classrooms she visits. “I've had some great teachers to work with,” she says. “For example, I go around the classroom while students are working on problems. If I see that lots of kids are having trouble, I'll say, 'I see that everyone's having a problem with number 9.' And we can talk about it.” She even taught one class, incorporating lessons from her ILC, “Inclusive Methods and Curriculum for Middle Childhood,” which linked a computer science course for education majors and a curriculum development course. Wearing a bright blue shirt with black slacks and jacket, Patrick Heffernan stands in front of the blackboard in a Main Hall classroom. He's tall and lanky, with unruly brown hair and a pale complexion, and a tendency to tuck his chin down and look up through his bangs when he feels a little uncertain. Then the music starts, and Heffernan launches into a whirlwind of a multi-voiced, singing, talking, ringing, shouting, buzzing, grunting, nearly hyperventilating five-minute musical monologue. It blows your hair back. Today the students in Musical Theater Performance I are having their performances video-recorded, and Heffernan is doing “Franklin Shepard Inc.” from Stephen Sondheim's Merrily We Roll Along. Having driven himself (in the character of Charley Kringas) to the edge of a breakdown, he holds his final wild grimace until the camera beeps, then lets out a loud gasp and runs back to his seat. Professor Williams calls out “Aw-right!” and applauds loudly. The students follow suit. But Heffernan is realistic about making a career of acting, and he appreciates the breadth and depth that a liberal arts education provides. This summer, that place is looking like Cisco, Texas, a little spot on the map west of Fort Worth, where the southern California native will be on stage for six weeks in the Big Country Dinner Theater and get a taste of the acting life, away from school and family and everything familiar. Somewhere in the brain's winding folds and branching pathways, scientists believe, lie the answers to many a fascinating question — How do humans learn language? Where do dreams come from? — as well as the possible solutions to many a troubling disease, from Alzheimer's to schizophrenia. But how does one begin to make sense of it all? Students like Lauren Turkovich, a newly declared biopsychology major, begin by dissecting a sheep's brain in neuroanatomy lab. The tan, oblong, rubbery organ is a palm-sized version of the human brain: Its main mass, the cerebrum, also looks like an interlocking mass of worms; and behind it, the marble-sized ball of the cerebellum also strikingly resembles a branching tree when sliced open. Fortunately, Turkovich says, she's not squeamish. Turkovich came to Wagner knowing that she wanted to major in science, probably biology. A course in social psychology that was part of her first-semester learning community exposed her to new ideas that fascinated her. Reading the course catalog, she discovered an interdisciplinary major that combines her interests in the sciences of life and the mind: biopsychology. The very first step she took toward her major hooked her: Professor Larry Nolan's introductory biopsychology course. Dr. Nolan, she says, is a great teacher. “He knows so much,” she says. “He makes it fun, and he makes it hard.” She has soaked in new ways of thinking about thinking: When you learn things, she explains, it's not like you're warehousing knowledge like a squirrel storing up nuts, but you're creating neural pathways in your brain. And every new learning experience reshapes the old. At Wagner, she has started to make connections between her academic interests and her concern for others. Having grown up around a friend who suffered from epilepsy, Turkovich believes she'd like to work with children and research. She has poured much of her extracurricular time into service projects that benefit children. Last year, she helped host a giant letter-writing campaign for St. Jude Children's Hospital. This semester, she joined the national service fraternity Alpha Phi Omega, and organized a karaoke night at the on-campus coffeehouse to raise money for the Make-A-Wish Foundation.